Welcome to B. E. M. co. Pvt. Limited. Manufacturer & exporter of Lifting Equipments. The company was established in the year 1959, at Mumbai. Technically soundmanufacturing facility & easy modes of payment help us to serve Indian Sub continent & Africa. Quality tested range, Enriched industry experience & Global quality standards are thefactors that help us to stay ahead of our competitors. We offer a wide array of Hook Block Assembly, Traveling Trolleys & Alloy Steel Chains. 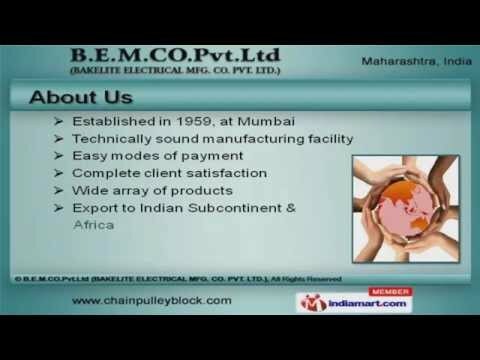 Chain Pulley Blocks offered by us are widely acclaimed in the market. Our Traveling Trolleys are best in the industry amongst others. We offer Alloy Steel Chains that are well known for their durability. We also provide Forged Hooks that are extremely reliable. Along with that we offer Hook Block Assembly that are a class apart.